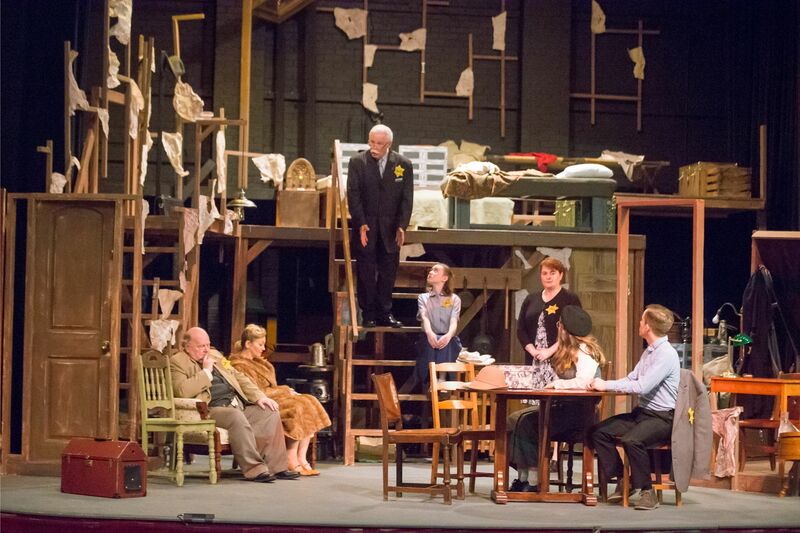 The Cast of Stage Right’s DIARY OF ANNE FRANK at the Crighton Theatre. The wonderful Stage Right Players, resident company of the exquisite Crighton Theatre in Conroe, Texas, is well known for its many delightful productions of musicals and comedies. But the group is not afraid to take on more serious offerings from time to time, as was the case with last season’s production of The Elephant Man. 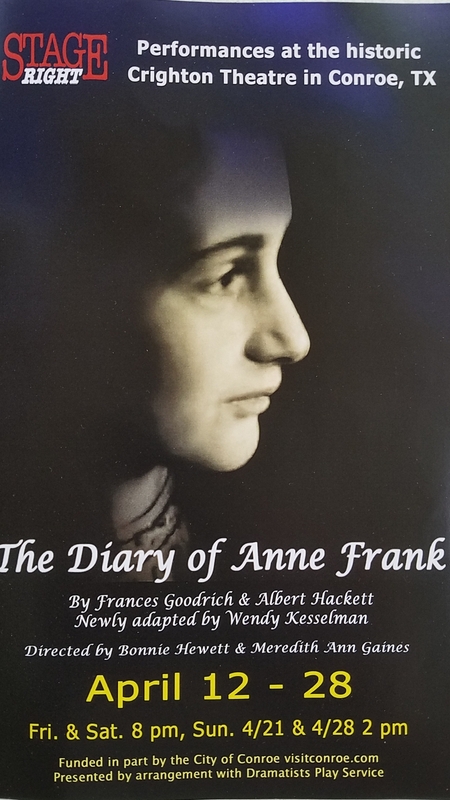 Continuing in that vein, Directors, Bonnie Hewitt & Meredith Ann Gaines, now bring us a poignant revival of The Diary of Anne Frank, the 1956 play by Frances Goodrich and Albert Hackett. The original Broadway production won the Pulitzer Prize, the Tony Award, and the Critics Circle Award. Based on the actual and tragic events recorded in Anne’s diary, this is a timeless play in every way, but what is perhaps most surprising is that such a serious drama can be at once so heartbreaking, while at the very same time being so uplifting. Such is the case in this epic 1940’s tale of eight Jews trapped for over two years in the hidden upper rooms and attic of an Amsterdam warehouse/office building. 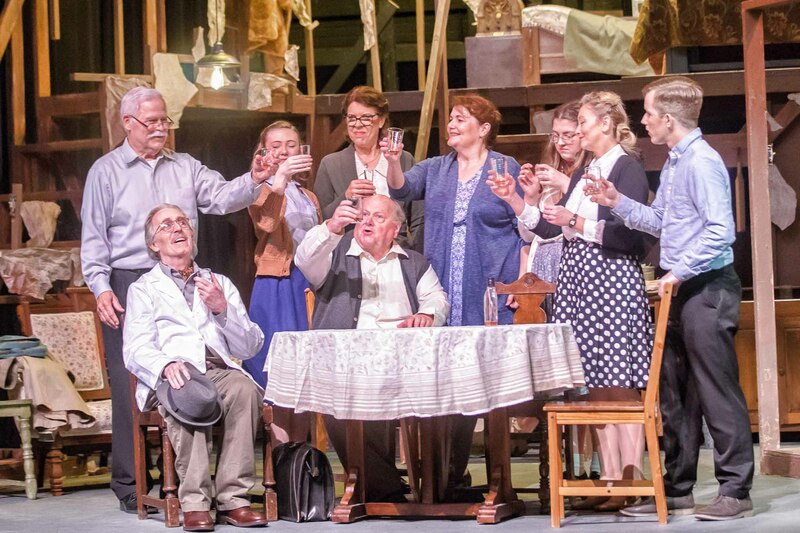 The cramped and authentic set from designers Hewett & Gaines, nicely frames the harrowing tale of these eight courageous souls, in their desperate attempt to avoid capture by the Nazis during the waning days of World War II. But before you even enter the theater to see that set you must first present yourself to a frightening German Waffen SS military officer (Baron Daniel W. Jackson), with an ominous guard dog at his side. If approved as an audience member your ticket will be stamped with the Nazi seal. That Nazi officer mans the entrance desk in the lobby and reviews your credentials as you present your theatre ticket for examination. 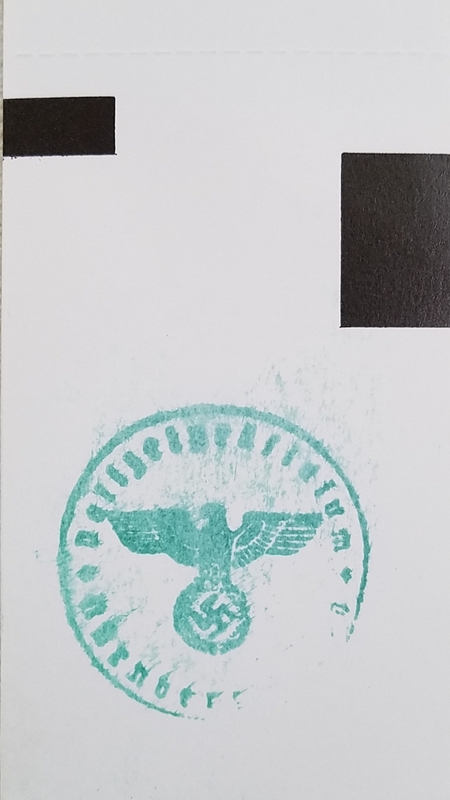 If approved, he will literally stamp the back of your ticket with the seal of the German Reich, and you will then be permitted to enter. My first exposure to this frightening story was as a young boy when I saw the 1959 film of the same name, directed by George Stevens. To this day I can still recall the horrifying sound of the frightening Nazi sirens racing through the streets below the confines in which these terrified war refugees were hidden. 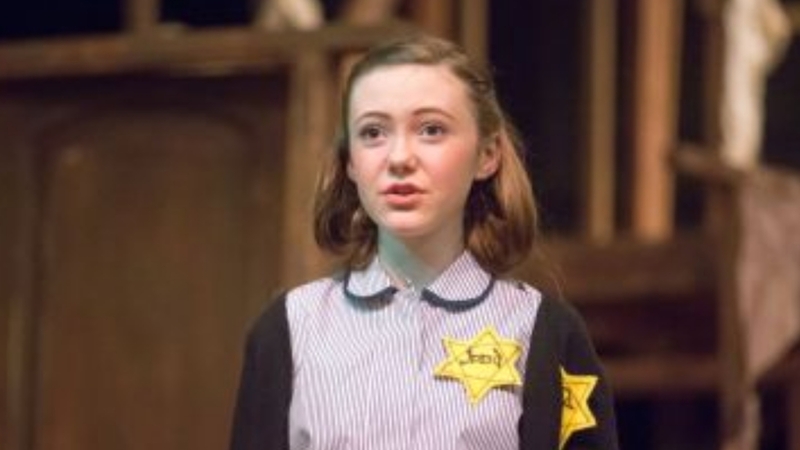 The central character in this drama is, of course, young Anne Frank herself, played here with splendid sensitivity and coming of age enthusiasm by Katie Kowalik. Katie Kowalik stars as ANNE FRANK. Anne helps to advance the plot by sometimes stepping out of character to address the audience as narrator, often accompanied by brief snatches of classical music. Kowalik’s performance as this thirteen year-old girl overflows with such joy and optimism in the face of extreme hardship, that it cannot help but lift one’s faith in humanity, the Nazi horrors notwithstanding. The characters trapped here with Anne include her father, Otto, (affectionately played by John Salinger), her patient and understanding mother, Edith, (Maria O. Sirgo), and Anne’s older sister, Margot (a gentle and subtly understated performance from Samantha Seeton at the performance I attended). In addition, we have Mr. Frank’s friends, the sometimes bickering Mr. & Mrs. Van Daan (Quint Bishop and Patrice Kentimenos), their son, Peter (Kevin Downs in a shyly sensitive portrayal), and a quirky dentist named Mr. Dussel, (John Kaiser). Nicely rounding out the cast are John Guest as Mr. Kraler, and Leona Hoegsberg as Miep Gies, two kindly Dutch souls who regularly bring food, supplies and cheerful encouragement to these imprisoned refugees, all the while carefully keeping secret their location. The period costumes of designer, Ms. Gaines, are accented by the Nazi-required Star of David patch each Jew must wear. That patch warns the populace that these people are forbidden many basic rights, and cannot even ride in a streetcar, let alone drive a car. Jews are disappearing day by day at the hands of the Nazis, and so it is that this valiant band is seeking sanctuary. Katie Kowalik as Anne and Kevin Downs as Peter. 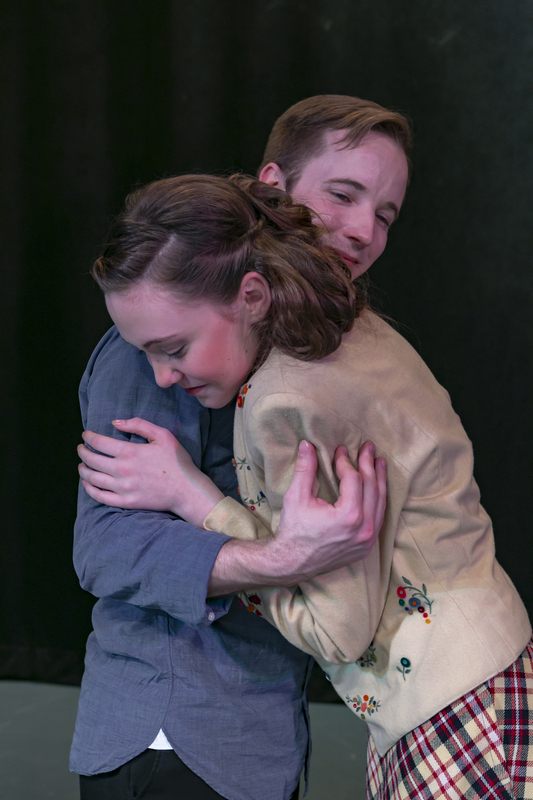 Diary of Anne Frank runs thru April 28th with performances at 8 p.m. Fridays & Saturdays, and at 2 p.m. on Sundays. Tickets cost $24, $20, $15, according to age, with discounts for groups. Reservations are available at www.stage-right.org, or call 936-441-7469 weekdays between 3 and 6 p.m. The Crighton Theatre is at 234 N. Main in downtown Conroe, Texas. 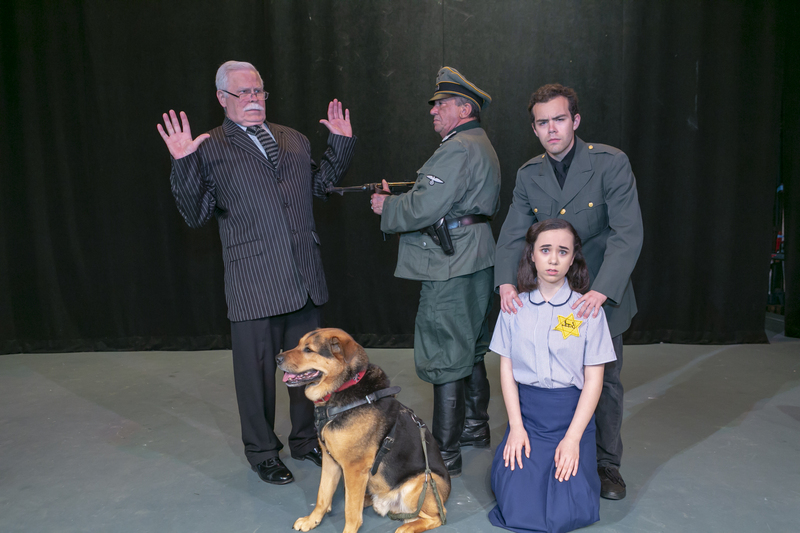 This entry was posted in ATCA, Broadway, BroadwayStars.com, Houston Community Newspapers online, The American Theatre Critics Association, The Courier Columns, The Lambs Inc., ThePeoplesCritic.com and tagged Albert Hackett, Conroe, Crighton Theatre, Diary of Anne Frank, Frances Goodrich, Stage Right Players. Bookmark the permalink.